Broadcast network television has been hemorrhaging viewers over the last several years. The increasing popularity of complex, well-written cable dramas like Mad Men and Breaking Bad has raised the bar for TV. Networks like the perpetually-ailing NBC are slowly figuring out that they can no longer get by with a few sloppy game shows and hour-long dramas about Debra Messing’s scarf collection (sorry, Megan Hilty — you were wonderful). They’re going to have to up the entertainment ante a little bit, which means making a Hillary Clinton miniseries in time to precede the 2016 presidential election. Since we’re talking about NBC, there are some minor logistical quibbles to raise right from the get-go. First of all, Hillary Clinton — although an almost for-sure 2016 presidential candidate — hasn’t officially announced that she’s running in 2016. With NBC’s recent bad luck, Hillary Clinton could totally decide that she’d much rather not go through all the trouble of running for president and instead spend the rest of her days watching cable dramas with her stay-at-home husband. Hillary, the four-hour miniseries that NBC is planning, sort of depends on Clinton’s looming presidential campaign. If she doesn’t run, it’ll be culturally irrelevant, like a Game Change set in a universe where John McCain briefly considered choosing Sarah Palin as his running mate only to eventually pick Joe Lieberman. Thankfully, we live in a universe where there’s plenty of Sarah Palin election fodder and where Hillary Clinton will probably run for president. 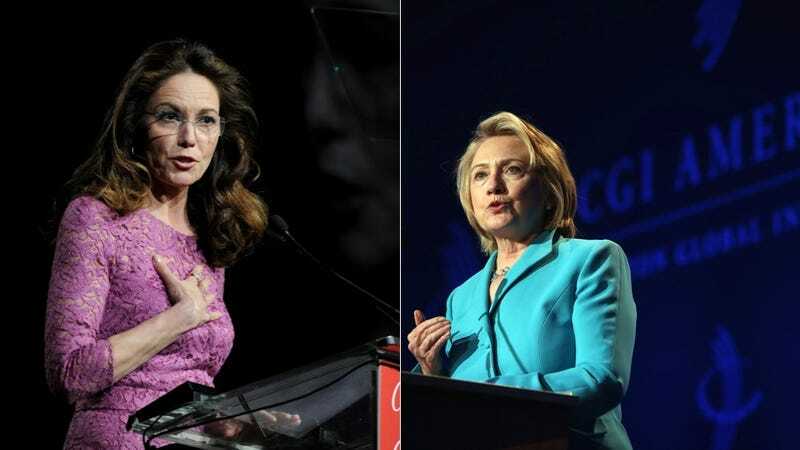 In this universe, a four-hour NBC miniseries starring Diane Lane as Hillary Clinton might garner some high ratings, and help prolong a trend of high-gloss network TV “event” productions aimed at scooping up some of those cable drama viewers who crave competent storytelling. According to the AP, the audience for broadcast network TV is shrinking by a rate of four-to-seven percent annually. The success the CBS’s Under the Dome has encouraged other networks to test their luck with expensive dramas, and NBC, eager to find some more viewers, seems to have put its faith into this new strategy — the network recently announced a Cleopatra miniseries, a Rosemary’s Baby TV movie, an adaptation of Stephen King’s Tommyknockers, and Plymouth, a miniseries about how the Pilgrims journeyed all the way to America only to end up on the God-forsaken shores of New England. The Clinton miniseries will, according to a statement from NBC, “recount Clinton's life as a wife, mother, politician and cabinet member" from 1998 to the present. The 48-year-old Lane, who went from playing Superman’s lover to Superman’s mother in a span of time that seems almost cruel in its brevity, will play Hillary, but the network has not yet settled on a Bill. Let’s get the casting rumor-mill churning by humbly suggesting John Slattery.